A major factor in the success of the Toledo men's basketball program is its outstanding weight and conditioning program, under the direction of strength and conditioning coach Brandon Hannum. In addition to a top-notch staff, UT has one of the finest weight rooms in the country in the Charlie and Nancy Creech Fitness Center in Savage Arena. Hannum has been instrumental in the Rockets' success on the court. Charged with the task of assisting each student-athlete in maximizing her athletic potential so as to enjoy a successful and fulfilling career, his specialized workout programs focus on the enhancement of physical abilities and the prevention of injury. The ability of Toledo's men's basketball players to compete at their highest levels of performance is largely determined by their physical level of development and preparation. A year-round training program is essential in developing their physical abilities, as well as to prepare their bodies for the potential stress that may produce or result in injury. The Toledo basketball training program consists of a complex combination of training programs that provide various stages of physical development throughout different periods of the year. The training programs include Olympic weight training exercises, free weight and machine-based weight training exercises, conditioning, flexibility and plyometrics. Each component is essential for performance enhancement and injury prevention. In conjunction with the training programs, each student-athlete is provided with a daily assessment of progress and training prescription for each exercise within the program. The system for this, designed by Hannum, provides a unique advantage that lends success to the training programs by maximizing progression and intensity. 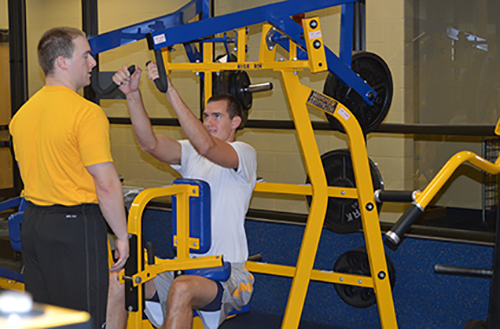 The basketball team currently trains in Savage Arena, which houses some of the latest in training equipment, including free weights, Olympic platforms, power racks, dumbbells and Hammer and Cybex weight training machines, as well as cardiovascular and plyometric equipment. The staff, program and facilities, along with the medical and athletic training staffs, offer Toledo's basketball players every advantage to maximize their athletic potential and their careers as student-athletes at the University of Toledo. CoachTK.com © . All rights reserved. UT Rockets logo © The University of Toledo.